The event is a collaboration of AEON MALL Binh Duong Canary with the Trade Promotion Center – Binh Duong Department of Industrial and Trade to contribute to the preservation and development of traditional handicraft villages in Vietnam. During the fair, there will be display booths to promote and introduce local handicraft products. Particularly, customers and visitors also have chance to watch the artisans making products. Minh Cuong Ceramics Co., Ltd.
Thanh Binh Le Co., Ltd. The fair will be held at the Central Court from 8th September to 11th September at AEON MALL Binh Duong Canary. This will be an opportunity for artisans to meet, exchange experience and for customers to know how to make a handicraft product. 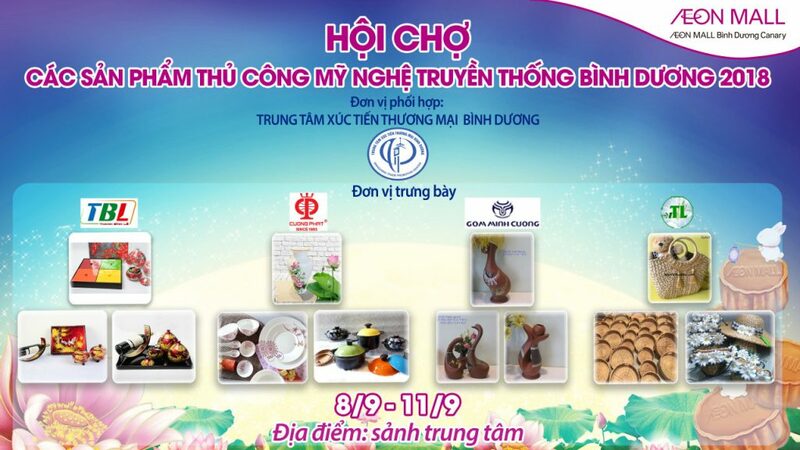 This is a great chance to promote traditional handicrafts of Binh Duong in particular as well as Vietnam in general. And once again, it is addressed that AEON MALL Binh Duong Canary is not only a place of fun and happiness but also a “promising land” to experience the traditional and cultural activities.